Matt Llano had a pretty darn good one on Sunday at the 2015 BMW Berlin Marathon. He finished 13th in 2:12:28, good for top American honors and a nearly four minute PR. It wasn’t his number one goal which was 2:10 or faster, but it was close. He was on 2:10:30 pace through 35k and though he struggled over the last 7k it was not a total collapse by any means. And the biggest thing for Matt, the reason we chose to do Berlin in the first place, was to get in another marathon experience and put him in position to be one of the guys with a real shot at making the Olympic team this February. He’s now the eighth seed going into the Trials so I’d say it was mission accomplished. See Llano’s full run file. 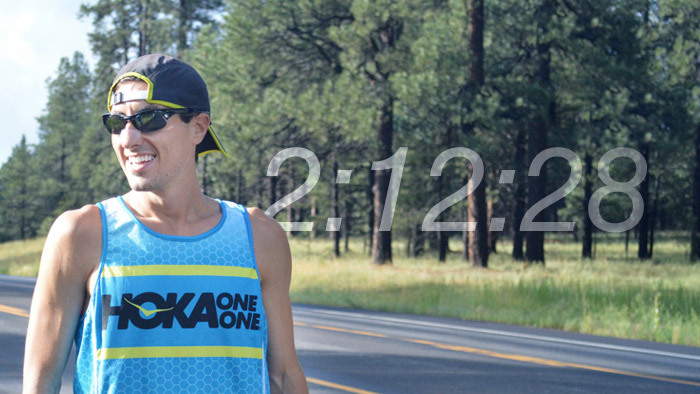 After Matt finished second at the USATF Marathon Championships in March, we had to make a decision about how to approach the next 11 months leading up to the Olympic Trials. At first I was leaning toward spending this fall just being really aggressive in training with super high volume and monster workouts. That way when 12 weeks out from the Trials rolled around we could actually scale back a bit and just focus on what we know works. But Matt had a different idea. He decided he wanted to run another marathon. As we talked about it I really got behind his plan. As a coach, it came down to the fact that I sensed Matt could gain a ton of confidence from having a good time under his belt heading into the Trials. Plus, I knew he could get a fast time in Berlin. It really is the fastest legitimate course in the world. I’d highly recommend it for anyone and everyone. So once we knew Berlin was the plan, the next step was deciding about how to train for it. Things had gone pretty well at the Los Angeles Marathon and really they had gone reasonably well in Chicago too (in his debut where he ran 2:11:00 pace for 20 miles before struggling mightily in the last 10k and running 2:17). So on one hand I didn’t want to change too much. But on the other hand you can’t just do the exact same thing over and over and expect different results. I wanted to get Matt in the type of fitness where even if things got tough at the end that he’d be able to hang on for a good finish. My thinking, and Matt’s, was that we needed to make sure the long runs were really challenging and that the mileage was higher than ever before. The solution was to change the makeup of our training cycle just a bit. For Chicago and Los Angeles we went on a cycle of hard-easy-easy-hard-easy-easy-hard-easy-easy-long in what was essentially a 9-day cycle. This time around we went back to a 7-day cycle where Tuesday was hard, Saturday was a hard long run and Thursdays alternated between a medium long run (15 to 16 miles) one week and a short leg speed workout the next week (10×20 seconds fast, straights and curves, 8×200, etc.). Check out Matt’s Training. In my mind, the Thursdays were really key. First off, on the weeks where we went medium long on Thursday we did those runs with no carbs in order to become efficient using fat as an energy source. Plus, it created a situation where his hard long run on Saturday was coming with that 15 or 16 miler on his legs two days prior. I felt like that was going to help callous his legs for the marathon for sure. The light speed workouts on the alternating Thursdays were a great way to wake up the legs a bit without causing any cumulative fatigue. They also help keep your form sharp in the middle of those high mileage weeks. Especially at altitude where our easy runs have to be pretty slow it’s important to keep some level of turnover going. The plan worked nearly to perfection. The one and only hiccup that I can really think of is that he didn’t have a good one when we did our big 16 miler at marathon effort three weeks out from the race. That was 100 percent my fault. The Tuesday workout that week was too hard. We did 11 x 1 mile, finishing in sub-4:30. It was a great session but in the future I won’t write such a hard workout the week of that 16 miler. But everything else went really well. And I think for every week besides the one I just mentioned, because we had three days between the Tuesday workout and hard long run, Matt felt really good on each and every Saturday. The only other small change we made was one that not all of you have to deal with but we did drive down from Flagstaff, AZ. (elevation 7,000ft.) to Camp Verde, AZ., (elevation 3,147ft.) more often than ever before to do some of our hard workouts at a lower elevation. Because Berlin is so flat and fast I wanted to make sure we did some training at a faster pace. In Camp Verde we can run roughly 12 to 15 seconds faster per mile that we can run in Flagstaff. I think that helped too and it’s something we’ll probably do moving forward. As for the race itself, there’s not much a coach can do once the gun goes off. At that point it’s up to the athlete and Matt did an awesome job. He got right into the pack that was going out at 2:10 pace. He stayed near the front of that pack but not right in front. He was relaxed. He was prepared mentally for when things got tough, which they nearly always do, and he fought hard all the way to the finish. You can read Matt’s TrainingPeaks race file here. We have to remember that the race itself is a workout too. The toughest of all workouts. And with this one behind him I think Matt is now just one small step away from making that Olympic team.